Crosley Cruiser review | What Hi-Fi? You’ve probably seen a Crosley Cruiser turntable on the high street. Whether it’s at John Lewis, sitting next to a wall of freshly pressed records at Urban Outfitters, or online at Amazon, these vintage-looking portable turntables are very popular indeed. They couldn’t be simpler to operate, they look great fun and the eye-catching retro styling of the suitcase is certainly appealing to first time buyers. But are they any good? The Cruiser is as plug-and-play as a turntable gets. Open the lid, place a record on the platter, pop the arm on the record, and off you go. It’s easy to get enamoured by the world of vinyl through such a trendy and easy-to-use product. 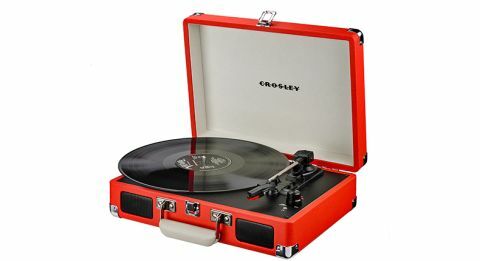 But if you’re really serious about playing records, we can’t recommend the Crosley Cruiser. For one, the tinny sound quality is hardly worth paying the sub-£100 price. More worryingly, though, the Cruiser will wear your records down faster than a typical turntable, due to an unusually high tracking weight on the cartridge. The weight cannot be adjusted either. Looking at the Cruiser, it’s easy to see why they’re selling like hotcakes. We like the suitcase design and its bright finish. Our review sample came in orange, but you can choose from black, turquoise, red, pink and blue. The wooden and leatherette build is surprisingly robust, too. This is a fully portable system, with two speakers (driven by a 3W amp) built into the case – you can see the grilles on the front of the unit. Once open (the locks are satisfyingly sturdy), the Cruiser has all the necessities – a tonearm, cartridge and mat all placed neatly inside. The tonearm is securely held, and while the build quality is mostly decent for the money, attention to detail is poor. There’s a lot of play in the arm bearing, which doesn’t inspire confidence. We measured the downforce on the Crosley Cruiser’s cartridge at just over 7g (typically, it’s around 2.5g on most decks), and this heavy burden will introduce wear on your records over time. Unfortunately, there’s no scope for adjustment on the arm at all. The Cruiser has three speed controls - 33 ⅓, 45 and 78 rpm, with a separate adjustment included for singles. On the turntable, you’ll find a dial for power and controlling the volume. It’s responsive and smooth to operate. Around the back of the unit, you’ll find the power plug, a pair of RCA analogue outputs to feed the turntable into your main hi-fi system, and a 3.5mm input for plugging in iPods and music players. There’s also a 3.5mm headphone jack near the volume control too. It’s a decent spread of features for a budget turntable that does it all. At this price, we aren’t expecting a fully rounded and insightful sound from the Crosley, but the bright and tinny sound is still a disappointment. We play a range of records from Duran Duran’s Notorious and ABBA’s Should I Laugh Or Cry to Carl Orff’s Carmina Burana. Voices are shrill, and there’s not enough resolution to hear deeper into the mix. There’s a tune in there, but no enjoyment to be had from it. It’s the same presentation whether you’re listening to vinyl or playing a Spotify playlist through your iPhone 6S. Through headphones, the sound is hazy and noisy – we actually prefer listening through the speakers. A bit more body and weight, and things would be better. But the built-in speakers are hardly capable of delivering a detailed and dynamic sound, let alone do any better than the worst flatscreen TV speakers. It’s a shame, as we really wanted to like this portable turntable – it’s such a lovely thing. We really wanted the Crosley Cruiser to perform well; as an idea it’s great, and anything that makes vinyl more accessible and gets people interested is a good thing in our books. But the product has to deliver. The Cruiser’s tracking weight is a serious issue, and the turntable’s speakers are a disappointment. Both you and your record collection deserve better.